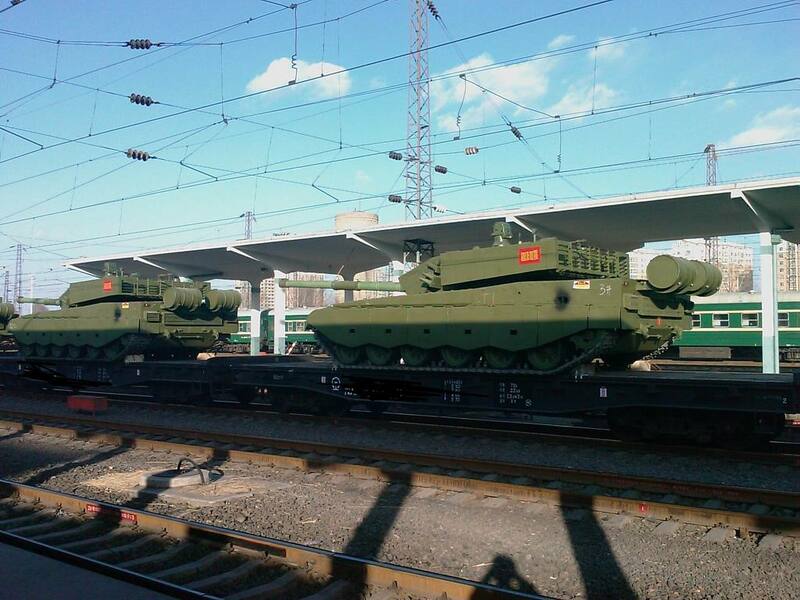 How did the Chinese end up with PLA ZTZ-99A MBT? 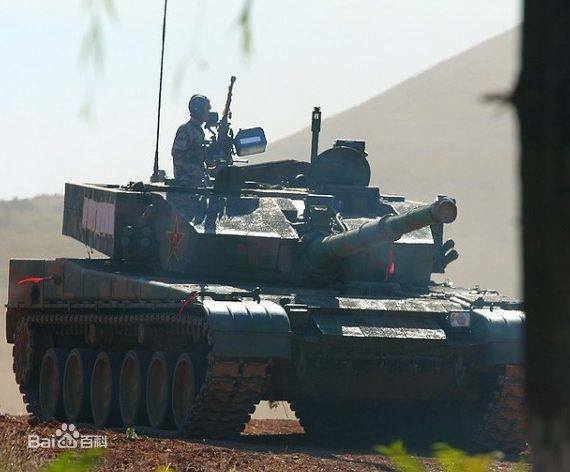 The PLA ZTZ-99A MBT (Type 99) came to be what it is today from various upgrade programs that began with the Type 98, the Type 98 mostly a prototype was produced between 1996 and 1998 and was developed from the studying (Reverse engineering) of the Russian T-72 MBT. 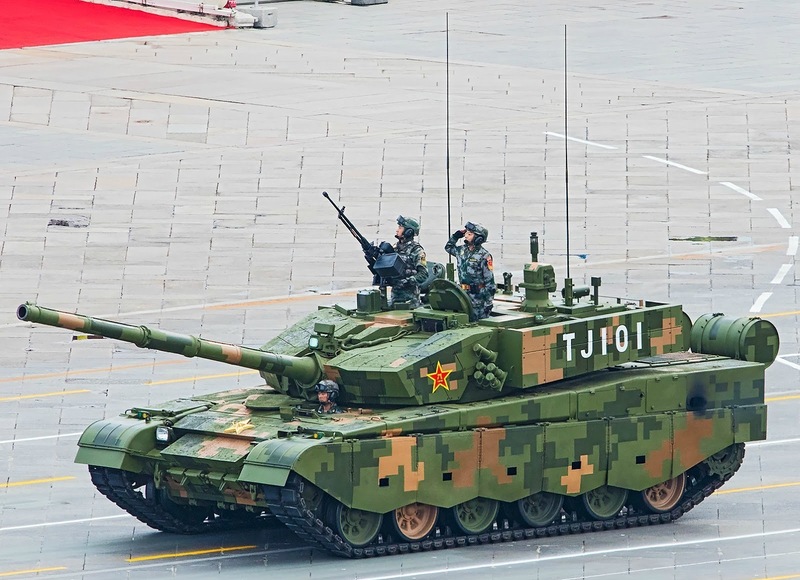 At least 18 Type 98 tanks were produced with none entering official service. You can see allot of the T-72 ancestry throughout the various upgrades and testing phases of the Type 98. From this research and development phase, they eventually unveiled the production version the Type 99 in 2000. 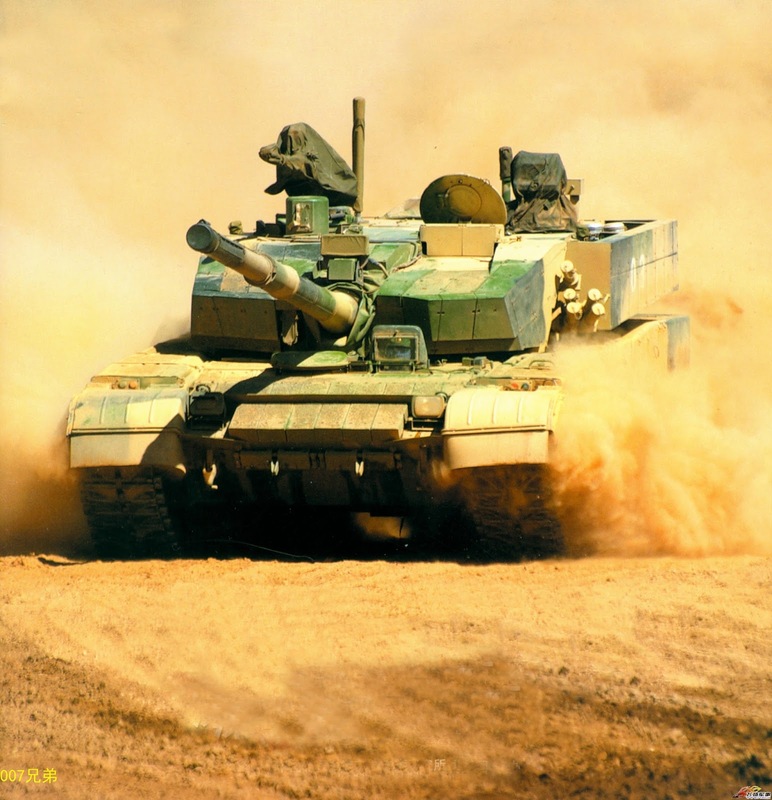 It is estimated that around 620 of these tanks have now been produced. 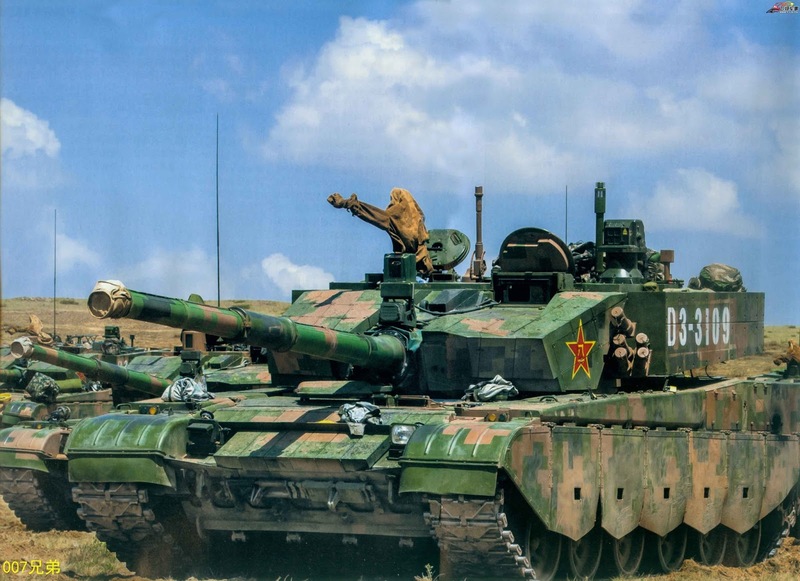 The Chinese have used ideas and design concepts from the west and east with the production version resembling a cross between a T-72 and a Leopard. However, the Type 99 is now looking more and more like a vehicle produced by a western country as it has gone through its various modernising programs. 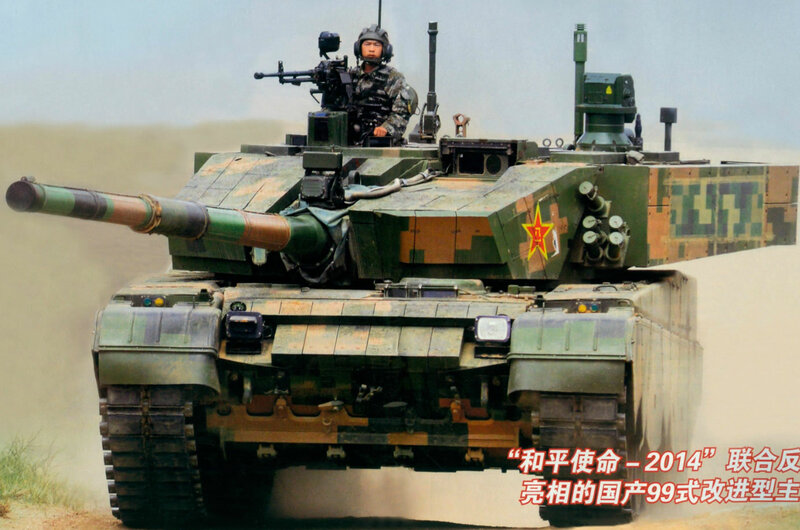 The major changes from the early version, the type 99 Initial version (in the below picture) to the Type 99A1 seen today, is the upgrading of the engine, suspension, new add-on Armour and the development of a new turret that resembles or has incorporated design features from the Leopard MBT. Panda Hobbies have based their kit on this version. The Type 99 has progressed through the following various versions to the Type 99A2 we see today. Most of these have been produced in kit form also as listed next to them. I’m not going to comment other than what’s below with the other kits in this review as they depict other versions to what is reviewed today. The Type 99 tank is armed with a fully-stabilized ZPT98 125-mm smoothbore gun, fitted with a carousel-type autoloader. This allows the crew to be reduced from a typical four-man crew to a three. Both the main gun and the autoloader were copied from the Soviet/Russian designs. Secondary armament consists of 7.62-mm coaxial machine gun and 12.7-mm anti-aircraft Machine Gun. 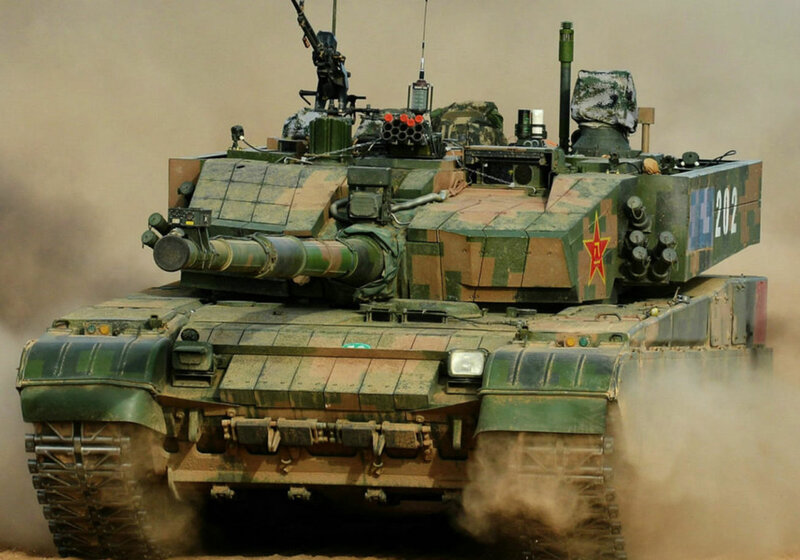 The Type 99 is also fitted with laser protection systems that can help it defeat and defend itself from missiles, enemy observation optics and helicopters. 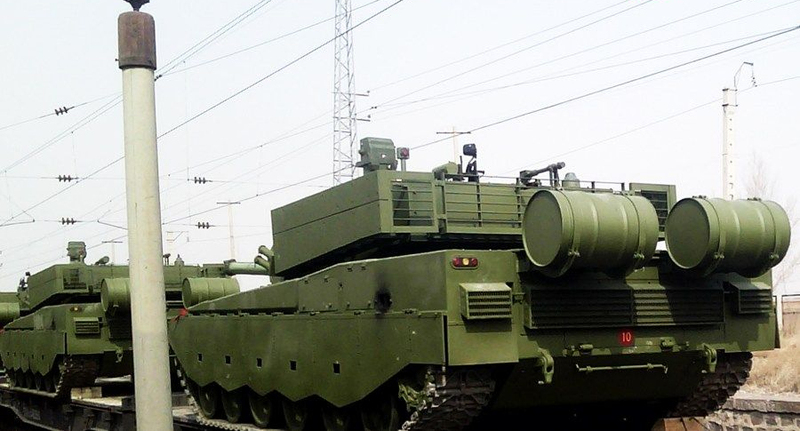 The fire control system on the later versions of the Type-99 is clearly superior to the T-72 MBT where it originated from, and unconfirmed reports suggest it might even be superior to the T-90 MBT. (picture below is a rear view of the new Type 99A2 is starting even to look a little like and M1A1 Abram from this angle). 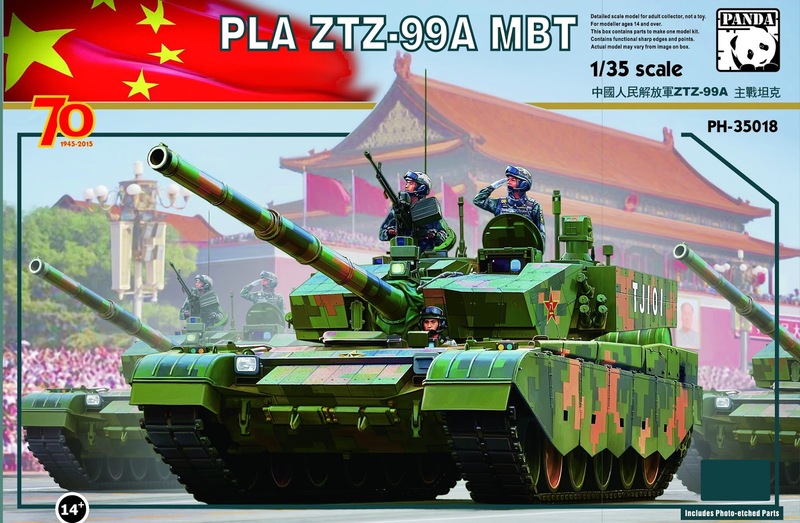 Now we know what a PLA ZTZ-99A Main Battle Tank (Type 99A1) is, it’s time to have a look in the box today and see how Panda Hobbies have fared in the release in what for most people is an unfamiliar subject. The kit is packed in a nice gloss smooth finished box that is relatively strong in design. Inside the box, you will find a user-friendly instruction manual, a single A4 page in black and white with a multi-view diagram of the vehicle and camouflage pattern and a layout of the parade format from 2015 showing vehicle numbers and their positions during the parade. The decal sheet although small contains enough numbers to depict any of the tanks from the parade format on the previously mentioned single A4 page. The kit parts are broken up into nine sprues with all of them being moulded in a tan colour besides one sprue moulded in clear for the clear areas such as periscopes and lenses. Lastly, there is a small photo-etch fret with some minor detail. Like most Tank kits, these are the two biggest single items in the box, split like normal with the lower hull and top hull in two pieces. The lower hull is very simple and nicely moulded with good detail such as fine bolts and weld seams, some minor clean-up will be required to remove a small amount of flash and sprue gates, however, this is nothing that should concern you . Moving onto the top half of the hull now and they have done a reasonable job moulding this component, they have moulded the anti-slip areas very finely and consistent, maybe to fine and consistent. I will discuss this more shortly. As the bottom part of the hull, they have continued with the fine bolts, weld seams and other crisp details like the lifting triangles for the engine deck and intake vent for the engine. On the underside there is injector pin marks but none of these will be seen once the side skirts are attached, like the lower hull however you will require to remove a small amount of flash and sprue gates. I test fitted the two hull parts and it is a great fit. The Anti-slip finish on the kit can be seen in the below picture; Panda needs to be thanked first of for providing what they have, for the majority of modellers this will be sufficient. However, you will need to be careful when painting not to lose the effect. Now for those looking for that extra bit of realism will want to enhance this effect, as you can see in the other picture below the texture is quite course and random not fine and consistent like Panda have depicted. To overcome this though there is various methods out there being used by people, a quick search on Google or YouTube will give you plenty of options for this. On this build, I’m going to try a product new to me True-Earth Rough Casting & antiskid, this has received great reviews. More information in the next part of the review. There are two of the sprues, on these sprues are simply the main track links, detail on the face of the track is quite good and sufficient for those who don’t mind assembling and dealing with individual link tracks and have the time they will do the job nicely. You also get a track jig in the kit to assist with the assembly. The jig can be seen present on sprue F though and can be seen in later pictures. Personally, I like workable tracks and will most likely use a set of workable tracks when I build this in the next part of the review. The next double sprue in the box is Sprue C, and they contain the rubber pads for the tracks only. No immediate issues can are initially present with these parts. It is great to see that they are separate individual parts, this makes painting and weathering easier, and if you want to model a vehicle operating on prolonged exercise, it makes them easier to scuff or mark. Depending on the environment you depict the vehicle operating in you could also leave one or two of to create some added interest. Last of the duplicate sprues you will find the smaller parts that are required in multiples parts, such as the running gear swing arms, wheels, towing points and lights for example. As evidenced by this roadwheel, there is very little to no flash present, and all parts look to have good detail. One point of concern after looking at the sprue is the way the fuel drums attach to the rear of the tank; they are moulded as multiple parts and the construction process has been made more complexed due to this. They have done each fuel drum in two halves and due to this, with how prominent they are on the vehicle it will require some hours to clean up due to the various details on them being needed to be preserved. Panda is not the only manufacturer that does this with modern eastern vehicles, with the new technology of slide moulding we should be able to get round objects in one piece now like we see more companies do with the main gun barrels in new kits, especially large prominent parts. This sprue contains all of the main parts for the turret, like with the upper hull Panda have moulded anti-slip for the required areas. These anti-slip areas will get the same attention as previously mentioned when I build it. With Panda attempting to achieve this detail those who wish to at least at a minimum know where the anti-slip needs to be placed. All other parts on the sprue looked to be sufficiently detailed and moulded except one area, like the fuel drums they have done the barrel in two halves also. I know with Pandas sister company Kittyhawk they use slide moulding technology, so it would be great in future Panda kits to see the same technology there to improve the quality of the kits in some areas. This will also assist the modeller greatly. On this sprue the main parts for the lower hull will be found, there is some great fine detail on some of the parts. Of note from a quick glance around the sprue is the flash suppressor on the Type 85 cupola mounted heavy machine gun, it has been hollowed out at the tip, the vents down each side of the flash suppressor have also been hollowed out, and this will give a very realistic look when painted. On this sprue also contains the previously mentioned the track jig to assist those who opt to use the tracks provided with this kit. Curved mudguards are well represented although some might like the photo etched type instead to apply thier own damage. This sprue has clear parts for visions blocks and optical lenses, my boxing has large sink marks in them, this is one on the low points in this boxing and could be just a one-off though. This can be hard to fix the kit parts, I may make new ones from clear plastic card when it comes time to build the kit. This kit comes with a small photo etch fret that contains mainly mesh grills for the engine covers; it also includes smaller parts for the cupola mounted heavy machine gun and parts for the mud flaps. Like all vehicle kits, it contains a small sheet of screen printed waterslide decals with limited options. 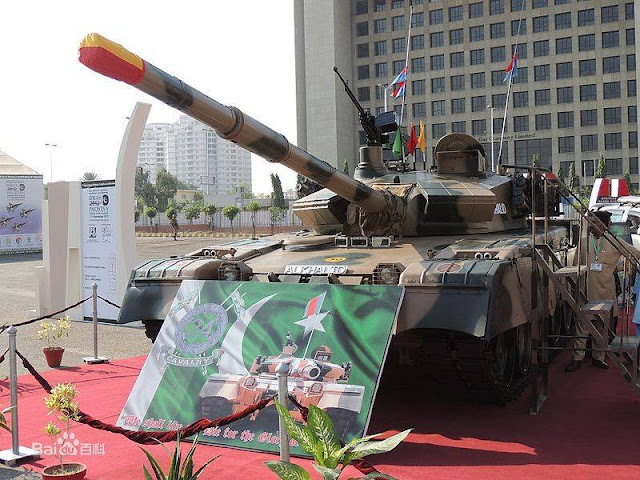 Provided though are a variety of numbers that will allow you to produce a variety of tanks, in the included parade format for the 76th Anniversary Parade recently held you will find some of the vehicle number configurations. This paper shows the parade formation for the ZTZ 99 and location of various tanks and their corresponding numbers. 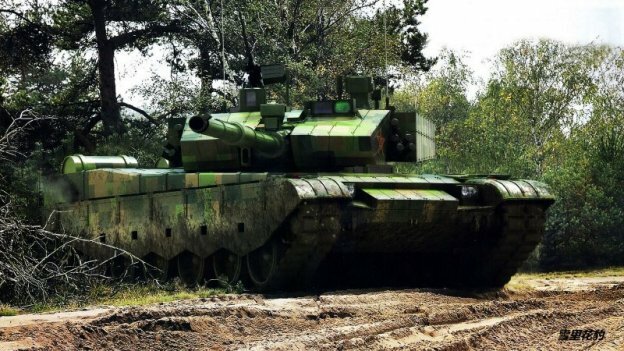 This is going to be a cracking paint scheme if pulled off properly; it is defiantly unique and colourful especially for a modern main battle tank as most modern main battle tanks have a limited camouflage scheme or are single in colour. The paint scheme being straight edged and digital will not be an easy task, there are a few companies who have made paint masks for this paint scheme, these are DN models and J’s work. I will definitely use one of these during the construction of them model, however, if your patient enough you can use the included 1/35 drawing and cut your mask from relevant masking tape. One let down when it comes to painting is the missing paint reference number for the lighter shade of green. The other included numbers are referenced towards Mr Color. 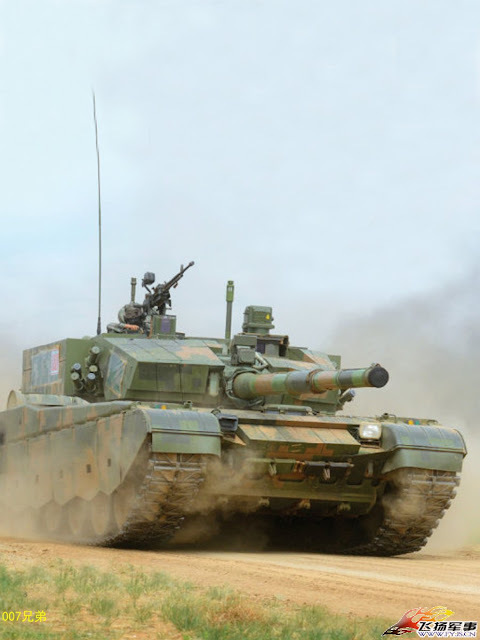 Panda is a new company and is slowly growing their military vehicle products. I have some of their earlier kits, and this kit is a vast improvement so it is good to see that they are trying to improve continually. There is, however, a few downsides to the kit, the split barrel, the split fuel tanks and basic detail provided for mounting them to the vehicle with, sink/shrunk areas on the clear parts and lack of paint plan details about paint numbers and manufacturers. The issues mentioned can be rectified, either through a little patience or the variety of aftermarket items available. Please don’t let you this turn you off wanting to tackle this kit, this is going to be a great kit for beginners as it has not been over engineered and even more experienced modellers will get a kit that they can work with to get a great result. (Below are some good pictures for weathering and display ideas, the turret on the stand is a crew training tool).